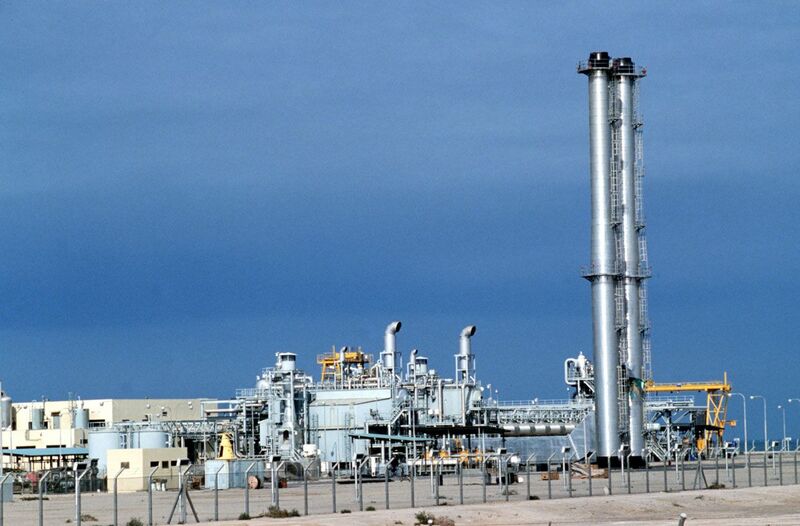 Drink Up: A desalination plant in Al Khafji, Saudi Arabia, is powered by fossil fuels. A new, solar-powered desalination plant is now being built in the city. It seems like a natural fit for desert dwellers: Use the sun to scrub salt from groundwater or seawater and make it suitable to drink. Armed with oil money, the Saudi government’s Saline Water Conversion Corp. (SWCC) has already built the world’s most extensive network of desalination plants. However, like many facilities in Saudi Arabia, those plants are powered mostly by fossil fuels. Thanks to a steep drop in the cost of photovoltaics (PV), solar power is now starting to look like a tantalizing replacement. As of press time, desalination expert Thomas Altmann of ACWA Power was expected to argue that solar power is turning the industry “on its head” at a conference in Paris in April, according to a session description. But a 2015 attempt by SWCC to commission a 15-megawatt solar PV–⁠powered desalination plant at Al Khafji, in Saudi Arabia, is behind schedule. When it does come on line, the solar power and desalination components will likely operate separately, insiders say. Another solar desalination plant, in Morocco, has also failed to integrate the two parts. Energy costs make up 40 to 50 percent of the cost of desalination, estimates ­Carlos Cosín, CEO of Almar Water Solutions, in Madrid. Industry leaders in Saudi Arabia, Abu Dhabi, and Chile are particularly interested in using solar power to run reverse-osmosis desalination, which uses electricity to pump saline water through membrane filters. Despite the missteps, a Middle Eastern country will still be first to operate a commercial solar desalination plant, predicts Cosín, who worked on the Al Khafji site. He estimates such a plant could open in 2021 or 2022. The countries in the region have lots of sunlight and stand to gain from cheaper freshwater, given the dearth of local sources. Switching to solar also means they could export more oil for US $65 a barrel, instead of selling it to desalination plants for subsidized prices. Renewable energy “actually is cost competitive” for some remote desalination plants, says engineering researcher John Lienhard, of MIT. But for others, that calculation depends on the type of solar power used and the kind of desalination that occurs there. Concentrated solar power (CSP), which uses circles of mirrors to direct sunlight toward a solar tower filled with thermal salts, generates electricity more consistently. It can also store heat for several hours, which certain types of desalination plants can use to evaporate saltwater. PV is less than half the price of CSP during the day, but it produces only electricity—not heat. That makes PV a better fit for reverse-osmosis desalination than for evaporation techniques. However, the Persian Gulf and the Red Sea are so saline that desalting seawater may drive up electricity costs for reverse osmosis. In such places, evaporative desalination paired with CSP might be best because the costs of evaporation do not increase with salinity. In fact, the Saudi government announced plans a few years ago to build 25 gigawatts of CSP capacity by 2032, and a 2015 study concluded that combining CSP with evaporative desalination could make sense in the Middle East and in the U.S. Southwest. But nobody has put any solar technology into commercial desalination practice. The original contractor on the Al Khafji site, which was designed to perform reverse osmosis using solar PV, narrowly avoided bankruptcy. SWCC divided the project into parts, handing the solar-PV component to one contractor and the desalination part to another. In the end, the desalination plant might run on the grid instead of on solar. The setback has not fazed the Saudi government. In March, King Abdullah Economic City, in Saudi Arabia, broke ground on its own solar PV–powered desalination plant, which will also lean on the grid.